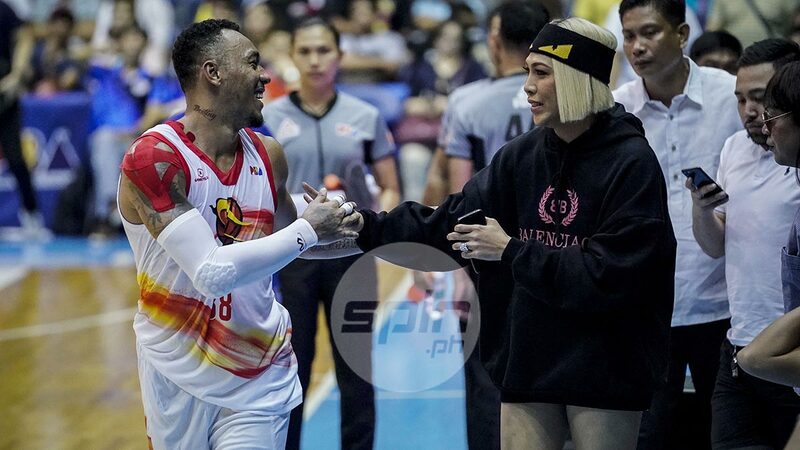 CALVIN Abueva said he personally invited popular television and movie personality Vice Ganda to watch Phoenix’s PBA Governors Cup game against Magnolia Pambansang Manok at the Smart Araneta Coliseum on Sunday. The 30-year-old forward said he bumped into the famous comedian - Jose Marie Borjal Viceral in real life - just recently and asked him to watch the Fuel Masters in action against the Hotshots. Vice didn’t disappoint ‘The Beast’ as he showed up for Sunday's game and watched from ringside, drawing wild cheers from the Big Dome crowd when he was shown on the giant screen. Abueva admitted Vice is an old friend and the godfather of his youngest son. “Nagkita kasi kami minsan, tapos sabi ko sa kanya, manood naman siya ng game namin,” said Abueva following the Fuel Masters’ 95-82 win over the Hotshots. The Phoenix star describes the comedian as a friend for a long time now. Abueva put together an all-around effort of nine points, 10 rebounds, and five assists in helping Phoenix notch a fifth win in six games, although he did struggle both from the foul line (3-of-12) and from the field (3-of-9). His shooting woes aside, the former San Sebastian star nonetheless is happy with the way things are going for the Fuel Masters in his first conference with the team following a trade with Alaska. “Nakatulong din na kabisado ko na rin si coach Louie (Alas) dahil nagkasama na kami sa Alaska, more or less alam ko na yung adjustment sa kanya,” he said.